I am sure you’ve been in the situation where you would like to grab a nice, tasty sandwich, freshly baked bun or warm slice of pizza straight from the oven. Well, Dubravica has all of that and more. Or sometimes you simply do not have time for a proper meal but do not want to buy one of those uninviting, industrially produced sandwiches. Then you should drop by my favourite bakery. 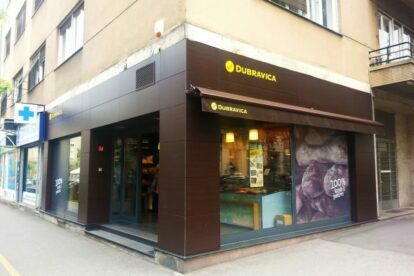 Originating from 1961, with the opening of one of the branches in the very centre of the city, Dubravica raised the bar very high for other bakeries in the city from all aspects. From interior design to the quality of products. In most of the branches there are tables where you can sit and have your brunch. With a generous and diverse offer of different sweet and savoury products and salads, you will have a problem to decide on what to have. Prices vary from 1,5 kn for a small pretzel to 18 kn for a tasty prosciutto sandwich. I have to single out two yummy products I consume most of the times I visit Dubravica. One is the baked mustard sandwich topped with sausages and the other is the cornflour roll with butter and prosciutto. I almost forgot the main thing – they have branches all around the city centre. Bon appetit!